Three graduates employed at a leading sheeting and cladding firm are living proof of the intrinsic value of a degree. 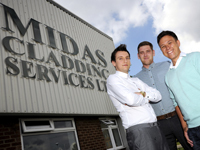 Teesside University graduate Martin Gilbey, the managing director of Midas Cladding, used the University’s Graduates for Business Scheme when he needed to employ two extra people to fill vital roles in his expanding firm. Martin and the two graduates he employed, Scott Ayre and John Skidmore, have degrees in Criminology, Geography and Law respectively, but all three have found that qualifications in an unrelated discipline are no barrier to success within the construction industry. Martin, 31, began working part-time for Middlesbrough-based Midas Cladding while he was studying for his BSc and was offered a full-time role when he graduated in 2003. In 2011, as the firm expanded from a £350,000 to £3million turnover and Martin began to take on more responsibility, he turned to Teesside University’s Graduates for Business Scheme to help him recruit a trainee Health and Safety Administrator. The University was able to help him find Scott to fill the role and a year later was also able to help recruit John for Midas as a trainee estimator. Martin, who also has a Master of Business Administration (MBA) from Teesside University, said: 'I was taking on more directorial duties and needed somebody to help out with the other work I was doing. 'I wasn’t really bothered about their backgrounds as my own background wasn’t from a related discipline. I just wanted somebody who was ambitious and keen. 'You know when you’ve got somebody with a degree they know how to work under pressure and we can give them the guidance. Anything they don’t know we can teach them. Scott, 24, said: 'It wasn’t too difficult coming into the construction industry, I just had to get my head down and work hard. 'Like when you’re doing a degree, you’re thrown a lot of information but you just have to force yourself to learn it. John, who joined Teesside University as a mature student at the age of 27, had worked in the construction industry before starting his degree. He added: 'Estimating is something I’d never really considered doing before. Laura Woods, Teesside University’s Director of Academic Enterprise, said: 'To complete a degree, regardless of the discipline, a graduate needs to be intellectually able, self-motivated and passionate about learning.